The grill was fired up, so these are grilled red peppers. Roasting and grilling produce similar products, but grilling adds a soft, smoky background. 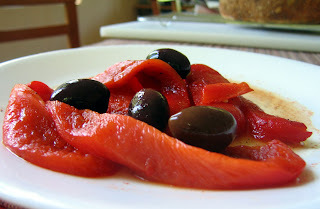 They made a fine lunch with a few Kalamata olives and a piece of New York Times No-Knead Bread. 1 Heat a gas grill to medium-high. 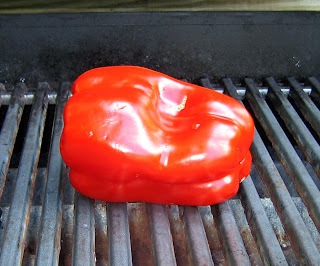 Wash the pepper and grill it over a medium flame, turning often, until the skin blackens fairly evenly. 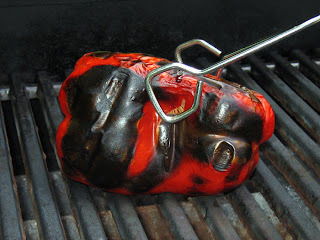 Notes: A charcoal grill works great but it's a lot of work for one pepper. I've held it over the flame of a gas burner too, which also works great until you get tired of holding it. My backup in winter is the broiler. Don't worry about charring the skin. That part gets scraped off. 2 Immediately place the hot pepper into a heat-proof bowl and cover. I use a stainless steel bowl and cover it with aluminum foil. Let it steam in the bowl, then cool, for at least 30 minutes. 3 When cool, hold the pepper above the bowl and pierce it with a sharp knife to allow the juice to escape. (You want to save the juice.) Cut away the stem, core, seeds, and ribs. Rub off the charred skin. Slice pepper lengthwise into 1-inch wide strips. Return strips to the bowl with the pepper juice, and toss with a dash of olive oil and vinegar, and a pinch of kosher salt and black pepper. Marinate in the refrigerator for at least an hour and not more than a day. I like to add a pinch of chipotle ground chili pepper. But I like things hot. Hot.